There are no half-stars or zero-star ratings. Basically, if I thought it was good, it gets three stars. If it gets just two, then it may be that I like the work but found a number of things about it that were less than stellar. Or it may just be that I'm not so much the target audience for a particular book—tastes being what they are and all. A one-star book is basically anything that I wish I hadn't read OR a book that really doesn't live up to its potential (or at least the potential that I had in mind for it). 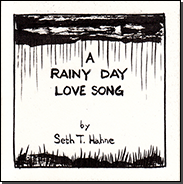 I'm Seth T. Hahne. There's no reason, really, that you should know my name. Really all that's important here is that I read a fair amount of both novels and comics, have a pretty fair sense of taste in these things, and enjoy helping other people find the books that are right for them. What else is there to me? I ride a Vespa as my primary means of transportation (actually, now it's a Stella, an Indian re-skin of a '79 Vespa). I did this no matter the weather for seven years. Then, on the seven-year anniversary of purchasing the scooter, I hit a spot of oil in a fresh summer rain and laid Bartleby (my Vespa) down in a crosswalk less than a block from my office. It could have been a lot worse. Even so, since then I am pretty much unable to curb my terror of riding in the rain. Even though I did it hundreds of times without incident in the five years prior. My dad was a hippie and a professional ceramicist (a.k.a. a hairy potter) for years. My brother and I grew up on the beach in an artists' community in California. I prefer playing sports to spectating. I like John Coltrane, Colin Meloy, Battles, and Cream. My wife teaches both Greek and Latin and I know only a smattering of Spanish from when I worked in restaurants. The only thing I learned from three years of French is how to say: Mademoiselle, may I go to the restroom, please? I'm as little impressed by this as you are. I was one of the first videobloggers on the internet. I felt like I was part of something special, sitting at the forefront of something that could really take off. I was even featured in the Guardian as being someone to watch. Then YouTube launched and nobody cared about videoblogging anymore. *sigh* Always a bride, never a bridesmaid. You're Also an Artist, Right? I am. 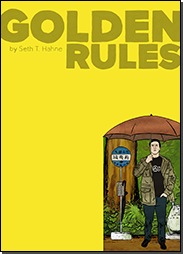 I do illustrations for web magazines, am currently working on illustrating a children's book, and even published my first comics (Golden Rules and A Rainy Day Love Song) in early 2014. Check it out, you might think it's the stuff. I also run a bookclub discussion group for comics and so I'll gradually begin building a library here of study guides for books we've discussed—just because I know what a pain it can be to come up with decent discussion questions. Anything to help my fellow man and all. So why do you reverse manga images in your reviews? Outside its printed context, there's no immediate way for a reader to know whether a Japanese work has been presented in its original format or reversed. Beyond that, there's no sure way to immediately tell if a book is Japanese or Western (stylist cues may lead one to guess but especially as one diverges from the mainstream, guessing becomes more and more dicey). For this reason, I present all comics in a left-to-right format. This keeps panel art consistent with the left-to-right writing of the review that surrounds it and prevents those unfamiliar with the nowadays-typical right-to-left style of reading in Japanese imports from being caught offguard. I will receive and write about review copies. I will treat your product fairly and honestly, attending each book with due diligence before writing a review. You may wish to browse through my reviews to see if your publication seems a good fit with what I've already spoken of favourably. Any submission of review copies may be initiated through the Contact page. Apparently there is some ludicrous federal law that those who receive comped review copies of books need to let readers know about it on their sites. Even though reviewers of films, games, music, theater, and many other things don't have to abide any such odd regulations. Here's the thing: if you find a dude who regularly gives glowing reviews to stuff that's just crap, stop reading their stuff. Their opinions and thoughts are obviously not connecting with you so whether they're some paid shill or honestly just have different taste than you, they're not helping you find stuff that you like. So dump 'em. No harm, no foul. As for me, I do receive a good number of review copies in the mail—as well as a ton of unopened emails with digital review copies (I hate reading digital so will rarely review books in this format). There is no expectation between me and publishers stating that I either a) have to review their books positively or b) even have to review their books at all. Here's a book I received free from First Second that I wasn't particularly enamoured with. I actually only end up reviewing less than 1/5 of review copies sent to me and review copies make up around 10% of my content. Still, for all that, though I pay for most of the books I cover (or get them free from the library), it's probably just best to assume that every book I review is one I got for free. I mean, that's what you probably think about movie and music reviewers, right? And somehow, you still soldier on—because you're a respectable person and not the moron that the government presumes you to be. And hey, you should be more worried about creators I'm on friendly terms with. Having good conversations with artists or writers at conventions or on Twitter or through the emails leaves me substantially more likely to overlook issues in their product. Because that's what life is like. I'm more likely to overlook the faults in my kids than I am the faults in yours because of the relationship. It's the same with books. So, it's like, what can you trust? Not much. Cave canem, eh?